Not to be confused with "Telephone Man" by Meri Wilson. (1984) "My Secret (Didja Gitit Yet?)" 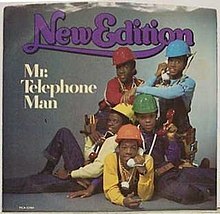 "Mr. Telephone Man" is a song by New Edition, and the second single from their eponymous second album, New Edition. Released as a single, by December 8, 1984, it was being added to the most "Hot Black" radio station playlists. "Mr. Telephone Man" included lead vocals from Ralph Tresvant, Ricky Bell and Bobby Brown with a rap by Michael Bivins and was written by Ray Parker Jr. The song was originally recorded by teenage singer Junior Tucker, who included the song on his self-titled debut album on Geffen Records in 1983. He also produced the original version as well as the cover by New Edition. The single reached number 12 on the Billboard Hot 100 singles chart and was the group's third number-one single on the Black Singles chart. Mixes included the instrumental and the "Extended Version". Producer – Ray Parker Jr.
Remix – Louil Silas Jr.
^ "Hot Black Singles Radio Action". Billboard. 96 (50): 48. December 8, 1984. ISSN 0006-2510. ^ a b c "New Edition – Awards". AllMusic. Retrieved June 23, 2013. ^ "Top RPM Singles: Issue 0500." RPM. Library and Archives Canada. Retrieved July 23, 2013. ^ "The Irish Charts – Search Results – Mr Telephone Man". Irish Singles Chart. Retrieved July 23, 2013. ^ "Dutchcharts.nl – New Edition – Mr. Telephone Man" (in Dutch). Single Top 100. Retrieved July 23, 2013. ^ "Charts.nz – New Edition – Mr. Telephone Man". Top 40 Singles. Retrieved July 23, 2013. ^ "Official Singles Chart Top 100". Official Charts Company. Retrieved July 23, 2013. ^ "CASH BOX Top 100 Singles – Week ending MARCH 2, 1985". Cash Box. Archived from the original on August 7, 2012. ^ "The CASH BOX Year-End Charts: 1985". Cash Box. Archived from the original on October 1, 2012. Songs written by Ray Parker Jr. This page was last edited on 8 March 2019, at 10:58 (UTC).